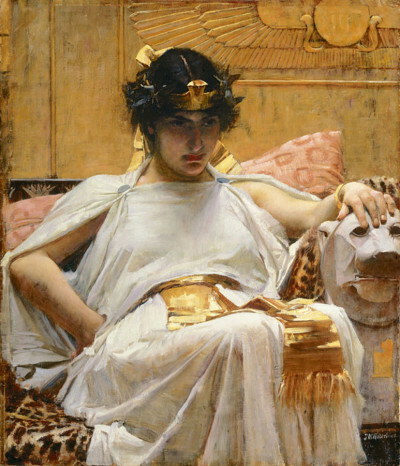 “Cleopatra,” by John William Waterhouse via Wikipedia. One fateful morning, Cleopatra sailed up the Nile to meet Antony on a barge whose billowing sails were made from gossamer-light orange blossom petals. Her white silk robe bore a long train made from even more orange blossoms, carried by her handmaidens, Neroli and Mandarin, who wear garlands of jasmine in their hair. The trio danced joyously and exuberantly, sending out a bouquet far and wide like a royal proclamation, one whose sweet floralcy was redolent with tart tanginess from green fruits and the zesty oils of the rind. The fruits’ sun-ripened juices poured off their bodies to drip below decks on sailors hewing oars of buttercream sandalwood and green vetiver. It was as though the Queen had captured every part of an orange tree — from the bright floralcy of the fresh flowers to the multi-faceted fragrance of its fruit, the green leaves which surround them, and the wood which bears them on the tree — and made them all genuflect in worship before enveloping her like a protective shield. As the barge moved up the Nile, the scenery changed and the mood softened. The white-blossomed sails now merely fluttered in a soft breeze; the pulvarizingly energetic, zesty, brightness of the wild Bollywood music became a slow dance; and the Queen of the Orange Blossoms lay languidly in sensuous repose on a pile of greenness as a golden haze of velvety ylang-ylang and sweet jasmine hung heavy in the air. The barge itself almost seems to melt into creaminess, and the water glistened with a shimmering of benzoin powder. They occasionally passed bits of driftwood, overly desiccated and oddly out-of-place, but they were small pieces that soon passed out of sight. When they arrived at the meeting place, the barge docked and you could see its name: Pichola.